I've often felt like I have a kind of split personality. On the one hand, there's the side of me that loves science fiction and action movies, who boxed and dreamed of an amateur career in the ring, who listens to dark, way-too-loud music, and who recently shaved off the left side of her hair. On the other hand is the side that loves to bake, coos over kittens, lusts after the clothes on Mad Men, and spends hours experimenting with makeup and manicures. That's the side of me that loves the cheesy 90s romcom "French Kiss" with Meg Ryan, Kevin Kline, and Timothy Hutton. If you haven't seen it -- and I wouldn't blame you for overlooking it -- although you really should Netflix it -- Meg Ryan and Timothy Hutton are engaged. But he goes on a business trip to Paris and falls in love with a local vixen. Meg overcomes her intense fear of flying to fly over to win him back, but through your usual series of romcom mishaps ends up robbed and lost. But the French thief played by Kevin Kline, who tried to use her to smuggle in his stolen goods, attempts to help her. At first it's just out of self-interest to get his stolen jewels back, but of course he ends up falling for her, and she, him. She realizes that Timothy Hutton is a schmuck and then she and Kevin Kline live happily ever after on a beautiful vineyard. The reason this movie is at all relevant is because of the scene where Meg, faking self-confidence after some coaching from Kevin, has dinner with her now-ex Timothy and discusses dissolving their relationship. At issue is a loveseat the two owned together. "Tell me if you think this is crazy," she says. "We get a chain saw and BUZZZZZZ! Right down the middle, and make two chairs." She might have been deliberately trying to provoke her ex, but I actually think it's a pretty good idea. In a small apartment, a piece of furniture can be twice as useful when it's been cut into two. 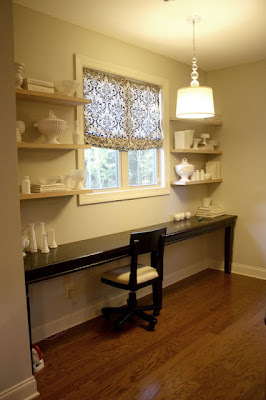 Tables, desks, and even chairs can be bisected and mounted to the wall (to make up for the now-missing legs). Now, not only do you have two matching pieces, but those pieces are slimmer and better able to squeeze into tight spots. It's also a really easy DIY, and fits a small budget; after all, you won't feel bad taking a saw to a cheap piece of Craigslist furniture. And it also seems so cathartic to just BUZZZZZ! that old dining table right down the center, just like Meg proposed. April and May Studio brings us this image from Dutch magazine VTwonen. A wooden stool is bisected and mounted on the wall, creating a unique pair of side tables. After moving a queen bed into a room that had previously housed a full, Mike and Katrina of At Home Alterations found that a traditional nightstand wouldn't fit. So, without knowing that it would work, they cut their thrifted nightstand in half and mounted it to the wall. Ta da! It looks awesome. Via Better After. 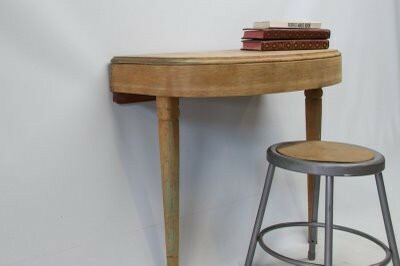 This one-of-a-kind piece from Factory 20 has sadly already sold, but it's a beautiful bit of inspiration for a vintage-y round table's transformation. Britt of Gus and Lula claims that she has a problem: "I have a habit of looking at a perfectly good, intact piece of furniture and envisioning myself dismantling, deconstructing, and all but destroying it," she says. But after seeing what she did with her $20 Craigslist dining table, I'd say her "destroying" it was all for the better! 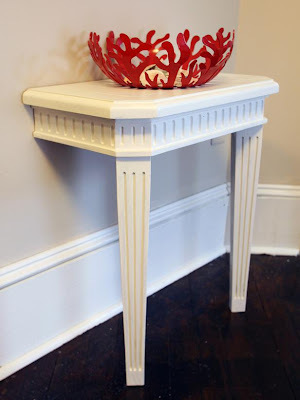 HGTV has an extensive how-to on how to create this awesome half-nightstand. I'm also loving the pop of bright pink here -- bright, neon-ish colors are really big right now! 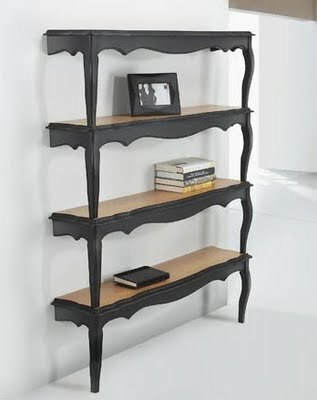 Also from HGTV is a creation by one of the contestants on Season Six of Design Star. (Why don't I watch that show? I really need to. I gotta break up my routine of Downton Abbey, the Daily Show, and Rachel Maddow somehow.) In their "Bed and Breakfast" challenge in the fourth episode, Karl takes an end table and turns it into two polished consoles. Beckie from Infarrantly Creative was given an old end table by her grandparents, but didn't really have a need for it. 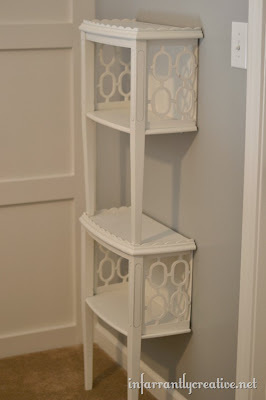 Instead, she turned it into a stacked shelf for her guest room that's really cute as well as practical. Her site also has a complete step-by-step how-to. ¿Dónde está la biblioteca? La biblioteca ya está aquí! Aaand that's all the Spanish I got, even with the help of Google Translate. But this Biblioteca Bookshelf from Umbra requires no translation. It's fun and really good-looking, and you don't have to lift a finger to make it. Designer Matt Carr was inspired by the idea of cutting two tables in half and then stacking them, but this piece is no-sawing required. Via The Glam Lamb. More an art piece than a piece of furniture, this Isabel Quiroga "Storyteller Bookcase" shows you the possibilities that can be had when slicing and stacking furniture. 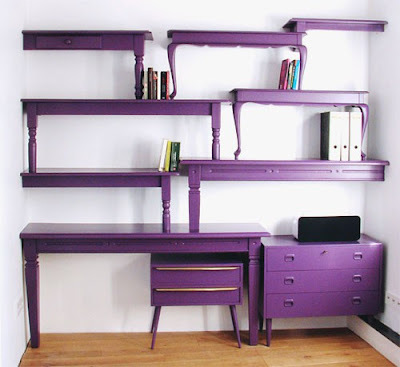 A mix of tables, desks, and dressers, all painted the same color for unity, create an extensive bookshelf with tons of storage. I also can't get over how awesome that bright purple is! Via Whipped Style. I need to break out Google Translate again for this last example. 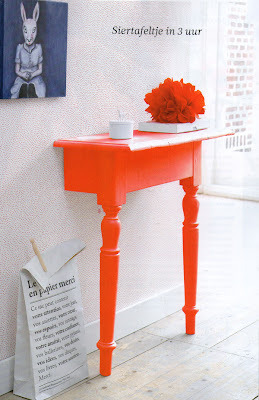 Zowieso is in German, but this bright orange console table is loud and clear. 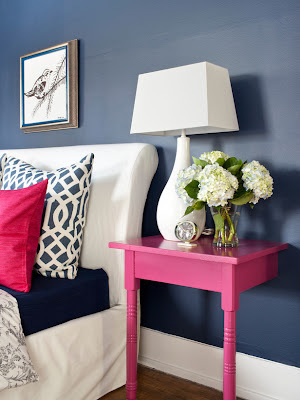 Another perfect instance of bringing in color to a small space with a fun DIY.